I am grateful, Lord, for revelations of Your majesty! In the eyes of the one who dares to examine the smallest part of Your mighty works, You leave no doubt of Your power. Nor will the one who seeks refuge in You fail to understand that You are strong to save! You overcome those who hate us on Your account. You draw us close to You in safety. Blessed are we, in You! 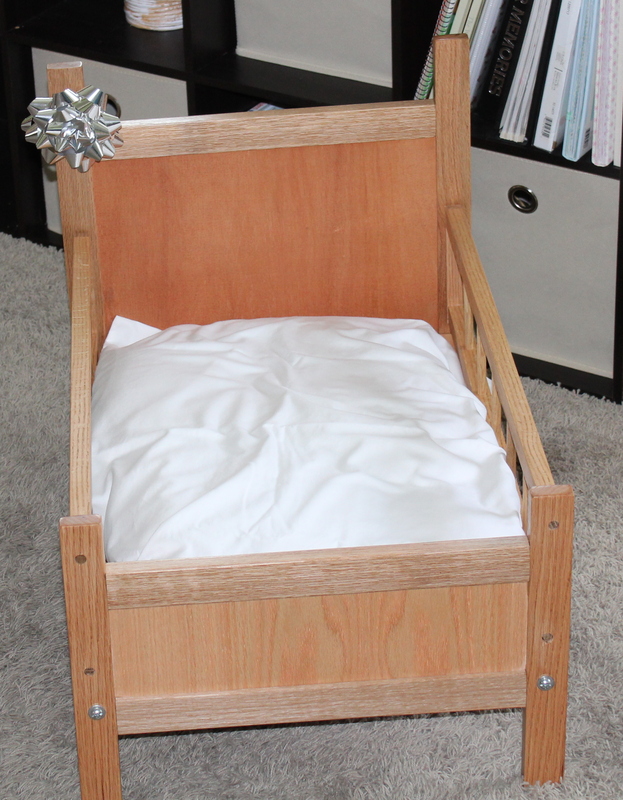 Keeping a promise, today will complete a short series on making a doll bed for my granddaughter. Here is a link to the previous installment. The four mortised bed posts are seen in the photo above, and four identical cross pieces are required with a matching tenon cut on each end. I did not capture a picture, but all of these have to have a slot cut on the inside centerline to inset the plywood that makes the closed head- and foot-boards. It is tempting to want to cut this slot with the dado blade on the table saw, and that could work for the cross pieces where the cut extends from end to end. For the bed posts, the slot is limited to the area between the mortises. I cut these slots 3/16″ deep with 1/4″ straight router bit. Because it is really difficult to get a saw setup to match the router setup exactly, I cut all the slots with the router. These can be done with only the top and bottom guides to keep the cut in the center of the board. One just has to be careful not to cut past the mortise on the posts. 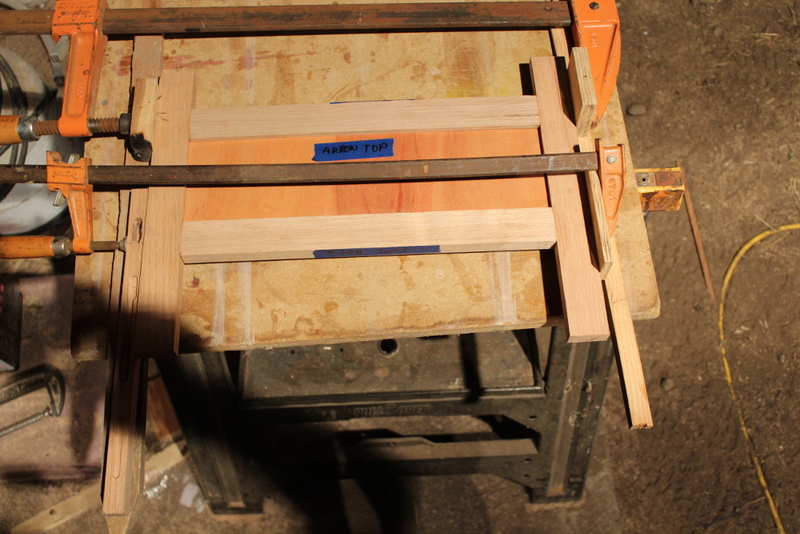 The picture above shows the glue up of the foot-board with the plywood captured in the slot. One should always test fit all assemblies without glue. Once satisfied that it goes together correctly, then add glue to the mortise and tenon joints only. The plywood inset floats freely in the slots, allowing for expansion and contraction with humidity and temperature without splitting or cracking. The bed rails in my design are painted angle iron. I welded a bracket on the end to take a screw to hold the whole bed together. This allows the bed to be broken down flat for storage. It would be perfectly acceptable to make these out of wood, but then I would not have gotten to practice with my new flux wire welder! Besides, I had the angle laying around from a previous project. The bottom deck is the same 3/16″ plywood that is inset in the head- and foot-boards. The side rails are made from the same 1×2″ oak as the rest, except they are ripped in half to give a 3/4″ by 3/4″ finished cross section. In between five vertical 3/8″ dowels are glued in to complete the rails. Holes for the dowels were drilled using a drill press, so the depth is easily controlled. 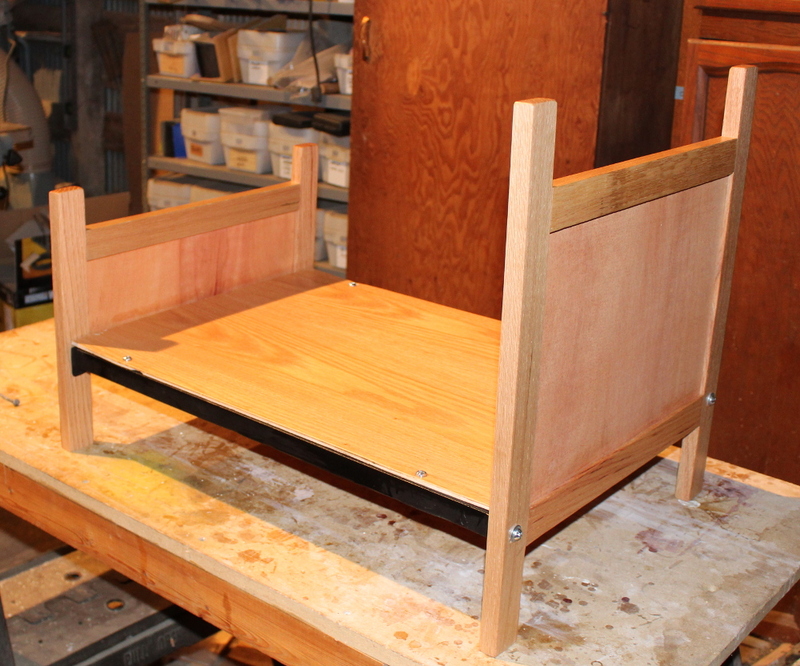 The rails are mounted to the head- and foot-boards with dowels that are glued into the rails but not into the bed posts. This arrangement allows for disassembly for flat storage. Finally, the finish (after some light sanding) consists of two coats of a simple wipe-on poly. I like this type of finish for items that get wear and tear because it can be refreshed to deal with scratches with a light sanding and a new coat. Thanks Deb! I only had to read your about page to find that we seek the same savior. I started my blog by posting some selected entries from my two-way journal with God, in the hopes that I could give an example of that type of communication. A while back I got a criticism that we weren’t meant to make that kind of conversation public (i.e. go into your closet when you pray). I’m still processing that. If you want to see some examples, you would have to go back a ways. Anyway, thanks for the follow!